Whether it’s a Quick Campaign to get that one offer in front of that one audience, or a more drawn-out, strategic nurture Campaign with multiple touch points, lead sources, and activities throughout, Dynamics 365 can take you from “nice to meet you” to effective RFP responses to signed quote. So why do some campaigns soar while others sink? After all, it’s the same tools, the same products and services, the same sales reps, etc. It comes down to execution and content, and here are three simple tips to apply to every campaign you send through your CRM to help both improve engagement and speed throughput. “Since 19-blah-blah-blah, we have provided services, A, B, C to industries X, Y, and Z, enabling… [the putting to sleep of every single person with the misfortune of reading stuff like this].” How many email messages, sales proposals, or collateral have you seen that start like that? Every message in every campaign sent through your CRM is not about you: it’s about the customer and the customer’s pain point. Talk about the challenge you know they face (after all, you have a product and/or service that solves it!) instead of your corporate history. If you must talk about yourself in your campaign communications, use other customers to do so — case studies and other social proof say far more about your business than you alone ever could. There are few things that sink a deal faster than miscommunication or missed communication. But if you automate your replies and check-ins, set reminders and tasks for reps, and take a “templated approach” to everything from prospecting emails to sales proposals, every communication can be timely, targeted, and far more effective. For most B2B sales people, automating tasks and replies in the prospecting process is nothing all-too-new. But automating sales proposals can prove challenging if you’re using CRM out of the box. However, a configure, price, quote solution (CPQ) makes sales proposal automation simple and seamless. Drip campaigns are a thing of the past: it’s all about nurturing now. So if your sales reps are using your CRM system to send emails every 3, 10, and 15 days after a prospect downloads a whitepaper, for example, stop them right there. Because emails and every customer contact should be based not just on a single action like a download, but on a comprehensive set of actions: web page visits and clicks, social media interactions, primary data from the prospect (e.g., job title, vertical market, etc. ), and more. And what you build is not a series of emails, but a nurture campaign that merges all customer behavior to create a comprehensive profile so that you go beyond, “Thanks for downloading: let’s set-up a demo,” to a series of responses and interactions unique to that prospect. While Dynamics CRM has some of these tools native, adding a full-fledged marketing automation system makes nurture second nature. 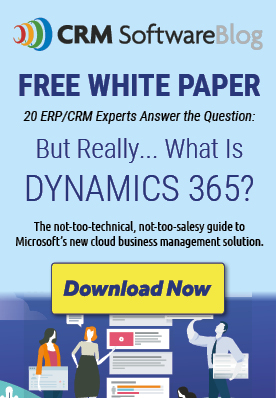 Questions about improving your campaigning and sales closing process in Dynamics CRM? I would love to hear them!